Maria Radomicki, left, and Pat Witcher, right, show off one of the blankets the group has made during March. 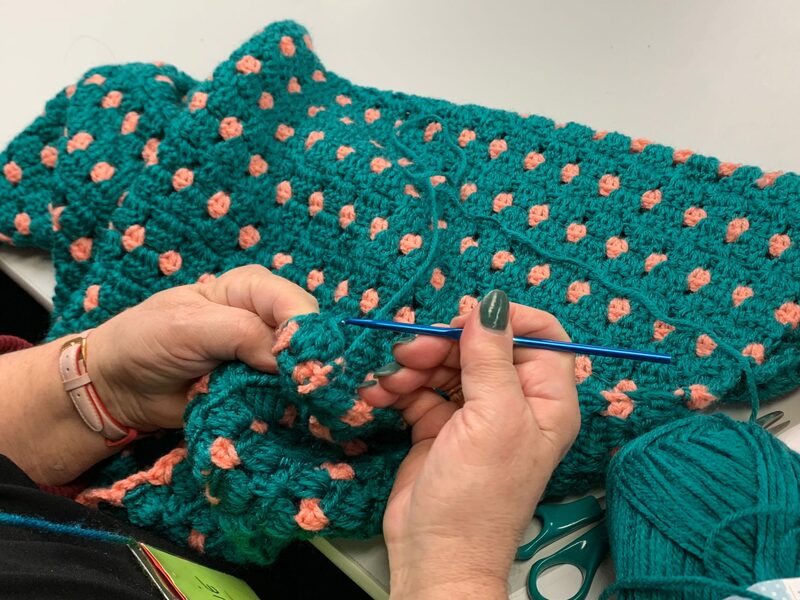 The Circle of Knitting and Crocheting meets twice a month at the Vogelson Memorial Regional Library to work on projects for charity. Pat Witcher holds up just one of the many blankets the group has made over the past month. Marv Gold works on her piece during the second meeting of the month for The Circle of Knitting and Crocheting. Rosemarie Dwyer works on a scarf on Wednesday, March 27 on the third floor of the Vogelson Memorial Regional Library. Maria Radomicki shows off a blanket one of the members of The Circle of Knitting and Crocheting made at the groups latest meeting at the Vogelson Memorial Regional Library. 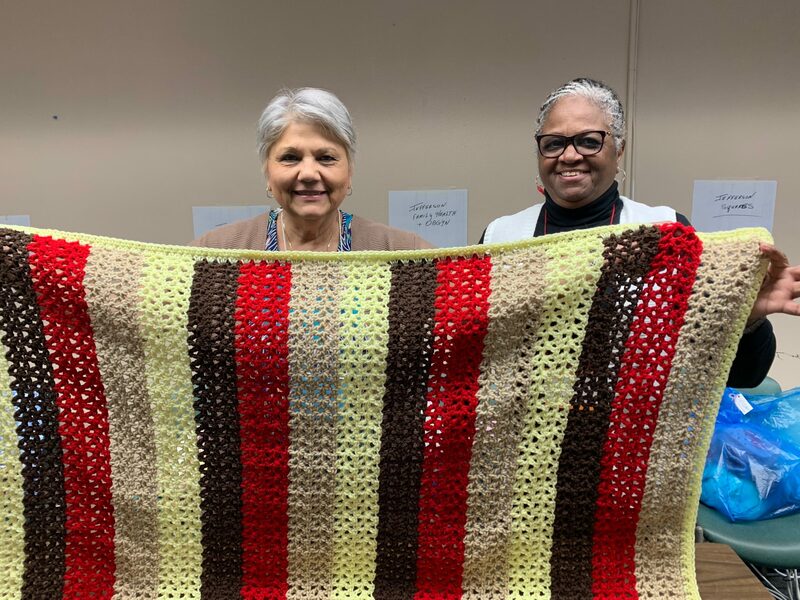 For the past 17 years, South Jersey residents have met to crochet and knit blankets, hats, scarves and more for a plethora of causes thanks to the Jefferson Health system in South Jersey. 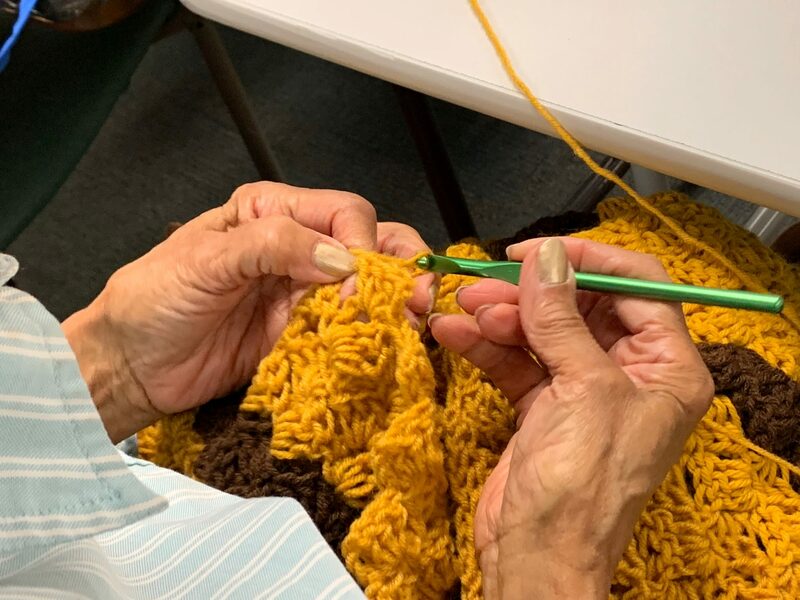 Meeting on the second and fourth Wednesday of each month at Vogelson Regional Library in Voorhees, the Circle of Knitting and Crocheting works together for hours alongside friends, new and old, on the third floor to help those in need and support an important cause. In a given year, the group, which consists of approximately 50 active members, can make as many as 10,000 items to be donated to charity. 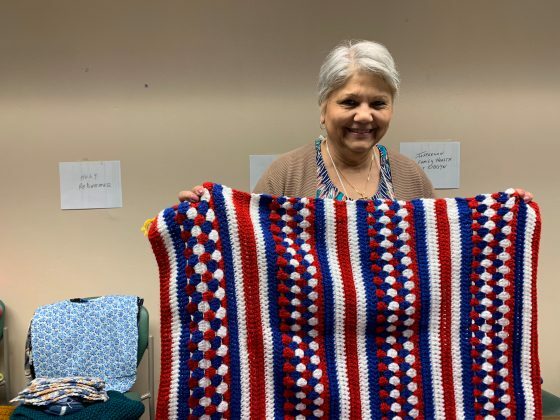 The group has made items to be used in numerous departments of Jefferson Health’s Hospital locations in Cherry Hill, Stratford and Washington Township, such as knitting and crocheting items for family health, acute care for older adults, dialysis patients and newborns, while also donating to causes out of the hospital as well, such as to military members or hospice patients. 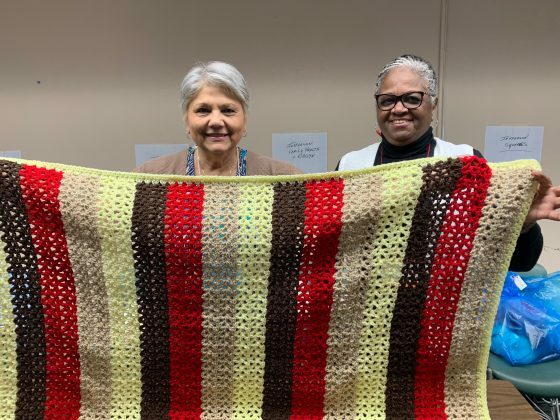 According to Tanya McKeown, corporate manager of community wellness with Jefferson Health, the idea spawned nearly two decades ago after reading about a celebrity who liked to knit to calm down. “There was an article about Julia Roberts knitting for pleasure to kind of just decompress, so my supervisor and I decided to put a feeler out in our newsletter to see if there would be any interest in people to join a group that wants to knit or crochet,” McKeown said. McKeown admits it wasn’t the most spectacular or groundbreaking way that led to the group’s inception, however spectacular things can come from ordinary places – as this group has been doing for almost two decades. “It’s just taken off since then,” McKeown said. The group consists of approximately 50 active members, according to Judy Mc, a regular member of the group. “Men are welcome too, but they never seem to stay,” Mc added, with a laugh. Mc said the group always strives to help whomever it can when approached by groups across the region. Years ago, Mc says a family whose house burned down was in desperate need of clothing, blankets and more, so the group helped lead the charge to create all kinds of items for the family, while also garnering additional donations. Essentially, the group has one overarching purpose. “If there’s a need, we fill it,” Mc said. The group has different needs or requests depending on the meeting; the women will then self-start their own project and create their own items for the purpose they want to do first before finishing and then jumping to the next one. The group is always welcoming new members, both men and women of all ages. Simply register to attend the group at camdencountylibrary.org and search for the Voorhees library tab under events. 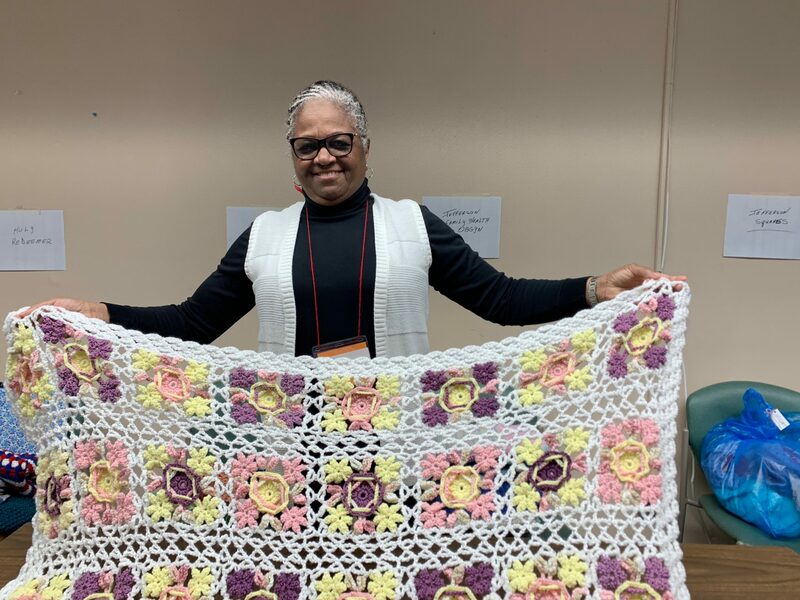 Most importantly, due to the group’s large production, the Circle of Knitting and Crocheting is always taking donations of yarn, fleece and other similar materials to assist in making items for the community. The largest need for the group in recent months has been plastic bags. The group made six plastic bag blankets during 2018, and is always in need of more to finish or start more, as it can take 600 to 800 plastic bags to make one blanket. For more information to join the group or drop off donations of yarn, fleece or plastic bags, the Jefferson Health PrimeTime group can be reached at (800) 522-1965 or by visiting KennedyisJefferson.org.